As I alluded to earlier, I have BIG goals and big ideas for my running self. I’ll be blogging a lot more about that when Chicago training officially kicks off next week. One of the things that I’ve been thinking a lot about is how to get from Point A (where I am now) to Point B (big goal). And, as you can imagine, since I am Type A to the extreme, I have a plan. 🙂 I’m making some changes to my training this time around. To the running. The extras. The attitude. Even (gasp) the diet and the drinking. And I’m excited about the changes and about the results that I think the changes will bring. But when I think about it, I want it all to hurry up and happen. Running wise, what I love about this meditation is two-fold. First, “Don’t limit how your growth can happen”. Love it! Definitely taking this to heart this time around in my marathon training because, in so many ways, I HAVE been limiting my potential as a marathon runner. Not this time. This time I am not only super motivated, but super open to new ideas, pushing myself to new limits and very focused on achieving BIG goals. 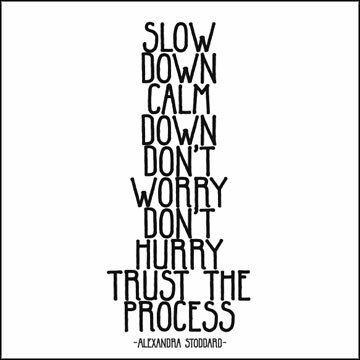 Second, but mostly, what I love is the whole trusting and respecting the process thing. Because a marathon training cycle is long. And often times it’s hard to see the big picture. It’s hard to see the impact of one workout and so it’s tempting to slack off or even skip it. It’s hard to imagine being able to run that fast for that far. And you question yourself and the training and whether it can, in fact, get you to where you want to be. 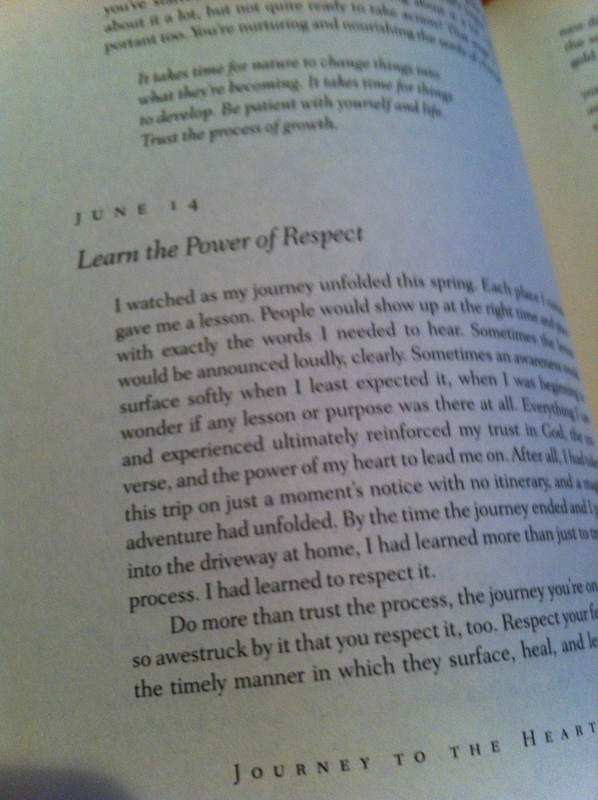 But – truly – you have to not only trust the process of training, but you have to respect it as well. You have to trust that the workouts are there for a reason. You have to have the discipline to follow the plan. And respect it. Do what it says. Not more. Not less. Trust it. Respect it. And if you do, you will have success. *All of the foregoing applies not just to running, but to life. 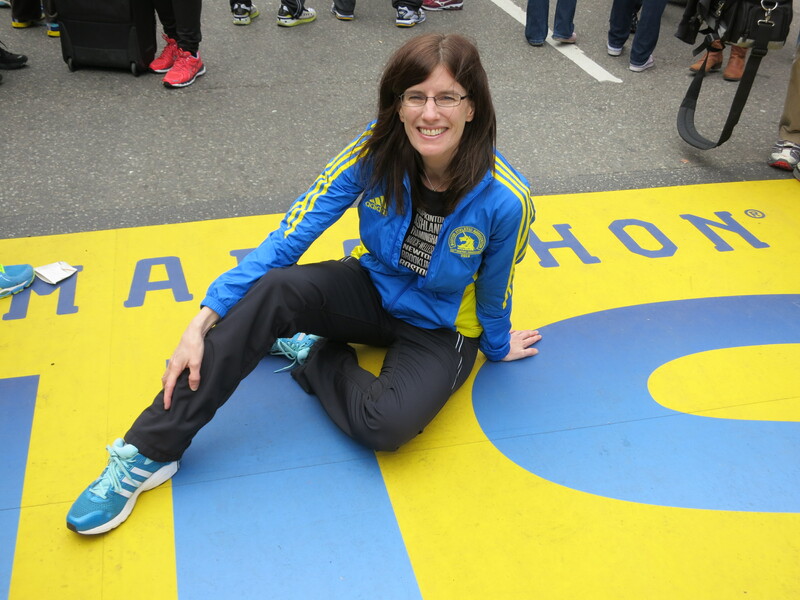 But since this is a running blog, I’ll spare all of you from hearing about just what it is that I want out of life and how I’m moving things forward to get it. You’re welcome.